A pair of little girls short suspender shorts and ruffled blouse. This, cute as can be set, dates from the 1930’s. 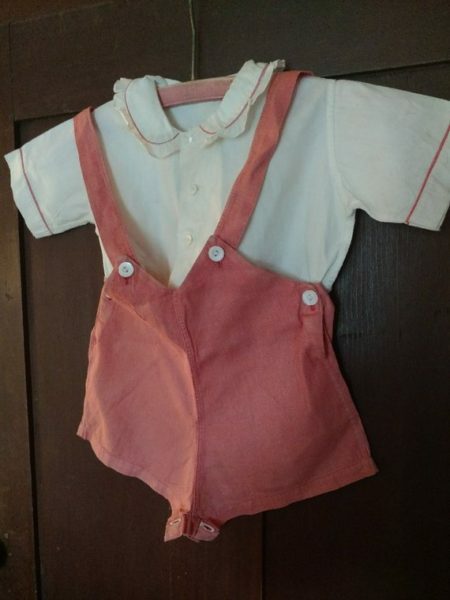 Love how the little shortalls are cut on a “v” at the center front. Such a sweet style, with the suspenders fastening at the waist, both front and back. Side fastenings, too, which also buttons to the bottom of the blouse, to keep the little playsuit neat and tidy. The ivory color cotton blouse, with its peter pan ruffled edge collar is trimmed in a narrow coral trim to match the color of the shorts.